When most people think about sports, they don’t realize how it can be used to promote children’s literacy skills! On the contrary, books that contain stories about sports have the ability to interest that may not enjoy reading. In addition to peaking interest in reading, books that contain stories about sports also have the ability to spark lessons filled with movement activities! Read! Move! Learn! by Carol Totsky Hammett and Nicki Collins Geigert contains stories that connect movement and literacy in fun and exciting ways! 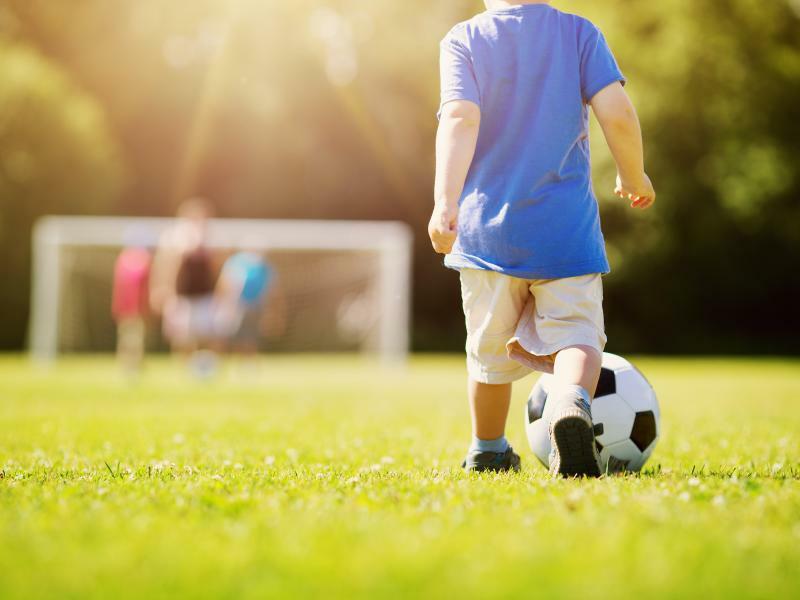 The following lesson plan connects sports, literacy, and movement! The book follows Froggy and his teammates, who all really want to win the City Cup. In the story, all Froggy has to do is remember what his coach said to do (and what not to do: Touch the ball with his hands!). This has the possibility of being a problem for Froggy, who seems to be more interested in doing cartwheels and picking daisies. Begin Story Time by sharing the book cover with the children. The colorful cover will enable children to guess the storyline. Some children will want to share their personal knowledge and experiences about the game of soccer and its skills. Discussions will help children recall their experiences, modify their knowledge, and create mew mental images. This imagery is important as children increase their vocabulary. Adding actions to unfamiliar words helps children remember newly acquired vocabulary. Froggy Plays Soccer has a wonderful collection of onomatopoeic words such as zap, zeep, znap, and zoop. When reading this story, ask the children to repeat the sounds with you. Drawing children’s attention to words with fun sounds piques their interest and heightens phonemic awareness. Playing with words helps encourage children to use their letter-sound knowledge. Invite the children to make up their own onomatopoeic words. Create a list as the children brainstorm new words. The text also contains several opportunities for children to join in the reading by chanting repeated phrases. After reading this story, the children will want to move. As you read the story a second time, invite each child to pretend to get dressed for the big soccer game. Encourage the children to interpret the story in a variety of ways. The goal is for each child to create movements that reflect his ideas. This will allow all of the children to see a number of unique interpretations as they pause to observe their classmates. ​Most young children have had some experience playing leapfrog. A game of leapfrog is a great way to begin moving. Remind the children to leap over one another carefully. If a child is uncertain about participating, do not insist. Observing others is an excellent way to learn and gain confidence. Note: This activity will be most successful outdoors or in a multipurpose room or gym. Safety Tip: Remind the children on the ground to keep their elbows close to their sides with their hands over their tucked heads. It is important to match partners based on size, weight, and experience with this skill.